The reason I chose these options is to maximise the performance. My computer is not exactly the most up to date machine around, and I don't want unnecessary things slowing it down. Thank you Howard for your insight. The choices you make in your configuration makes a big difference in overall performance. I suspect many of the remaining Windows XP users across the world much prefer to sacrifice performance improvement in favour of an impressive wallpaper, or modern Theme based on their favourite pop star etc. Nothing wrong with that. The flexibility to customise the Operating system to your own personal taste is good. However, you have a business mind thinking about performance. That is impressive! 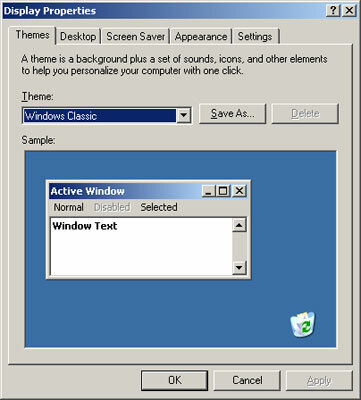 There are also several other things you can do to improve the performance of your Windows XP Computer. Autoruns is a Sysinternals tool that enables you to improve the start up time of your computer by removing certain programs from the start up process. Certain device drivers and other programs such as Adobe Reader add certain tools into the start up process. Lots of these are unnecessary. Use Autoruns to untick or delete the programs you do not want to run at start up. A word of caution NOT to delete anything you are unsure of! Another thing you could look at is the Performance Options in System Properties. For example, if you set the Visual Effects to Adjust For Best Performance, all of the settings such as fading out menus and animating windows when minimizing and maximizing are disabled. Each of these options takes up computer processing power and memory. Windows XP won't be as slick but you do get a performance boost. That is the performance trade off. Join in and write your own page! It's easy to do. How? Simply click here to return to New Install Of Windows XP.